– Northside Drive will be open only to cars with parking permits. The right-hand lane of Northside Drive will be converted to parking for 300 vehicles with permits. 250 free parking reservations for each day can be obtained online starting tomorrow, February 3rd, at 9:00 a.m. PST, through EventBrite. 50 first-come, first-served permits will be available each day at The Ansel Adams Gallery in Yosemite Village from 9:00 a.m. to 3:00 p.m. Those who obtain a permit online will need to bring a printed copy of their reservation confirmation to The Ansel Adams Gallery on the day of their reservation to obtain a parking pass. – Without a parking permit for Northside Drive, the only access to the “event zone” will be by foot from Yosemite Valley Lodge or El Cap Meadow, or by paying a fee to take a naturalist-guided tour with the main park concessioner, Yosemite Hospitality. When I first read this I wondered why they’re only allowing parking on Northside Drive, since the Southside Drive viewing area is almost as popular. In thinking about it, my guess is that the park service believes the Southside Drive area is more sensitive, since it’s near the river, so this is their way of discouraging people from going there. But it would be nice if they spelled this out. And this is supposed to be a pilot program, but with little water in Horsetail Fall, I wonder if the park service will really learn anything this year, since there will probably will be fewer people than usual. One side effect of this “event zone” is that parking along Southside Drive between the El Cap crossover and Sentinel Bridge will probably be closed off 24 hours a day between February 12th and 26th. So that means you’ll have to walk to Cathedral Beach, Sentinel Bridge, and the Four-Mile trailhead, even in the morning, and even if you have no plans to photograph Horsetail Fall. I haven’t been able to confirm this 24-hour closure, but it seems likely, since it would be difficult to close the parking areas off each day and then reopen them after sunset. It’ll be interesting to see how this all plays out! Makes me wonder if they will face an ADA lawsuit. Interesting thought. I’ll bet their lawyers weighed in before they did this though. Will there be parking for vehicles with accessibility placards? There will be accessible parking available inside the event zone. Vehicles with placards will not be required to make a reservation and will be able to drive into the event zone and park at El Capitan picnic area. Thanks for helping to clarify this issue Kirk, and for the link. Since this is all so new, it’s helpful to get every bit of information possible. Wow! Thanks for the heads up, Michael. I’m heading to there on 2/11. The whole situation seems a little over the top. I agree with Bill on a possible ADA lawsuits. Well I’m trying to get the word out so no one is caught by surprise. But some people will be surprised nonetheless. I hope you saw my earlier post about the lack of water in Horsetail. There’s hardly any detectable flow. By chance I was in Yosemite Valley on Friday, February 19, 2016. A few days before, the NBC Nightly News featured a piece on the Horsetail Fall light show. I cannot recall there ever having been anything about it on the news before, at least not nationally. Well, the scene in Yosemite Valley at 5:00 pm that evening was chaotic. There were parked cars pretty much lining both sides of Southside Drive and Northside Drive the length of the Valley, some of them halfway in the lane. Cars, campers even, parked off the road, some deeply into the landscape. Wherever there was a clearing, groups of photographers and their tripods where set up. Large gatherings of people sitting around in circles with ice-chests, etc., lounge chairs, you name it. It would have taken the National Guard to establish any kind of order. If park rangers had tried to enforce any rules at the beginning of this deluge they had given up by the time I passed through. I’ve never gone to Yosemite just for the Horsetail Fall spectacle, so I have no way of comparing 2/19/16 to other Februaries. I could not help but think that the NBC national coverage contributed to this disaster. (It also occurred to me that Aramark, the new Yosemite hospitality concessionaire, might have tipped off NBC.) You think of nature photographers as a caring lot. Environmentally sensitive. This crowd seemed to be having a tailgate party before the Big Game. They were day trippers of the worst kind. Not only did they trample the landscape, the flora and fauna, but their cavalier parking could have caused a disaster had a fire broken out somewhere, or there had been a rockfall and panic ensued. I think it’s a bit unfair to characterize everyone photographing and viewing Horsetail Fall as “day trippers of the worst kind.” That doesn’t describe most of the people I’ve met in those crowds. Mostly they’re very nice people who are trying to see and photograph an amazing natural phenomenon in person, and are making the best of a crowded situation by turning it into a chance to socialize and meet fellow photographers. Some are very serious photographers who have been trying to get a good photograph of Horsetail for years. Others are visitors who had never heard of Horsetail Fall before, but see all the crowds and people, and stop to find out what’s going on. In my experience it’s often the latter who park in inappropriate places, as they get there late and can’t find a place to park. In any case, it’s a broad spectrum of people who have come to view a natural event, rather than go to a ballgame or movie or sit at home and watch TV. There’s something to be said for that, even if some may behave inappropriately (mostly, I think, through ignorance, though not always). Here’s my “Yes, but.” There comes a time when the party has to end. We’ve all seen the signs all over the park admonishing us to “Please stay on trails.” “This area is undergoing restoration.” “Give plants a chance.” The goals of those restrictions should not be suspended because somebody wants to take their very own picture of Horsetail Fall from the vantage that is sought by hundreds of others. The historic Fire Fall off Glacier Point ended not because it presented a great fire hazard (though that may seem hard to believe) but because the spectacle attracted too many people and too many cars on the landscape in one area, and that caused environmental harm as well as safety issues in managing the crowd—just as Horsetail Fall in February has created. Of course, it was easy to end the Fire Fall, it was man made. Managing the Horsetail Fall crowds will be a much tougher problem. Reasonable people, who love nature and Yosemite especially, would respond to a campaign to protect Yosemite from being loved to death during the February light show. Personally, if I felt the need to “take Horsetail Falls in February late afternoon light” home with me, I would do well to acquire a photograph from someone, likely a professional, who has captured it in optimal conditions. I am a photographer. But I don’t have the equipment at this time that would allow me to capture Horsetail Fall as well as has already been made by others. But even if I did, I would not take pleasure in trampling the landscape with hundreds of others so that I could make it my own. Yosemite does not need us. We need Yosemite. Hence, we need to respect her and care for her. There could have been fifty or a hundred Ansel Adams’s among the throng I witnessed. Dedicated photographers, lovers of nature and Yosemite, on a pilgrimage to capture Horsetail Fall. There simply comes a time when people have to realize that foregoing one’s personal pleasure is necessary for the greater good. You’re lucky that you were able to enjoy it unfettered all those years ago. Times have changed. There are beautiful, uncrowded landscapes to shoot all over the place. It just requires a change of heart. Finally, what would John Muir say? Roger, the park service has a difficult job. Their mission is to “preserve unimpaired the natural and cultural resources and values of the National Park System for the enjoyment, education, and inspiration of this and future generations.” Preservation along with enjoyment, education, and inspiration, which can sometimes be contradictory goals. I understand your desire to protect the park you love (as do I). My objection was to your description of people you have never met, and your assumptions about their motives and character. 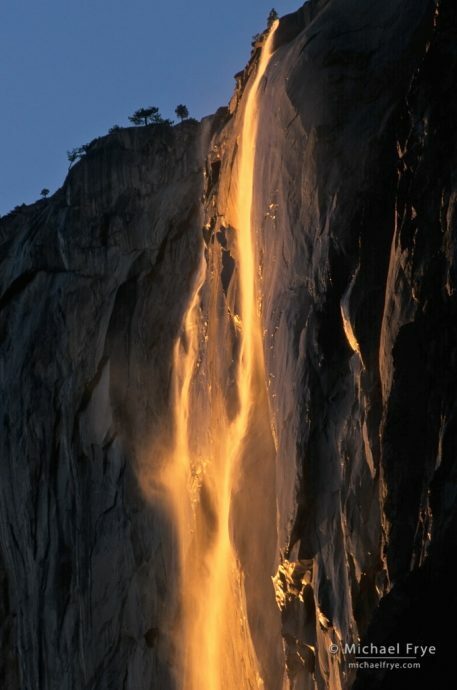 There is nothing wrong with wanting to view and photograph Horsetail Fall. And, aside from those who parked far off the road, or in the road, no one was doing anything illegal. It’s perfectly legal to go off trail in Yosemite except where specifically prohibited, and there are no “Area Closed” signs or fences in the popular Horsetail viewing spots. I have sometimes wondered why so many people want to make a photograph of Horsetail that will end up looking like so many photos that have been made before, but this discounts the actual experience of viewing it. Have you ever actually watched it under optimal lighting conditions? It’s quite amazing – actually much more spectacular than the photos can convey. It’s one of the most amazing natural lighting events in the world. And that’s where the “enjoyment, education, and inspiration” part comes in. I think people should be able to view this spectacular natural phenomenon. That fits perfectly with the purpose of Yosemite National Park. The park service has the difficult job of trying to allow people to view Horsetail, while still preserving the vegetation and river banks on the valley floor, and managing the traffic. They’re taking steps to try and strike that balance, and we’ll see where it leads. First – Thank you for using your blog to inform your readers of the changes taking effect for Horsetail Fall this year! The more we get the word out about this, the more informed visitors to the park will be prior to leaving their homes. A note on the Southside Drive location: It’s my understanding that the Park Service is blocking the pullouts there and generally making if very difficult to park for just what you believe. The area is close to the river and is more sensitive to impact than the Northside spot. I’ve also heard NPS has evidence that continued high impact might severely alter the bank and surrounding ground there. Notice though – the press release doesn’t say the Southside location is off limits; it will just be more difficult to get to, which should curtail the normally high crowds that also visit that spot. I guess we shall see… Thanks again Michael! Well of course – the more informed people are the better. And thanks for the additional clarification about the reasons for making access to the Northside Drive area more difficult. Roger, your words are petty well expressed, and they almost looks like they came out of a dictionary. However, the love for nature and photography does not run in your blood unfortunately. I do not see nothing wrong with people gathering to see a beautiful even like the one nature share with us all during this period of time. Horse Tail Fall is a wonderful phenomenon that I am glad the whole world is able to see and experience every year. You mentioned that people destroy part of the landscape with their vehicles and you’re right; however, in nature thousands of acres are damaged year after year and this is in part because nature knows the reason for this to happen. I rather see a vehicle parked on the side of the road during this event of Horse Tail and see people enjoying this magnificent gift of nature, than having some people complaining because “by chance” these peoples visit the park during this time of year. What we are forgetting here is the fact that the park is going to make a good amount of money by charging people for these parking permits. As a result, I invite you to visit more often the beauty nature has to offer. And perhaps, your way of viewing and thinking about it would be different. Visiting a national park “ by chance” is not sufficient to judge people that truly enjoy nature. Visiting and photographing a national park more often will chance you forever. Parece que el inglés no es tu lengua materna. Estoy familiarizado con el español, así que permítanme intentar hacerme entender mejor. Usted malinterpreta mi uso de la frase, “por casualidad”. De hecho, estuve pasando varios días en Yosemite. Lo que intentaba transmitir era que no estaba en Yosemite para observar Horsetail Fall. Tengo 62 años. He estado yendo a Yosemite desde que era niño. En los últimos diez años he pasado muchas semanas acampando en Yosemite. Lo he fotografiado extensamente, principalmente en primavera y otoño. Lamento no tener un sitio web que pueda indicarle ejemplos de mi trabajo. En los últimos años he estado haciendo un esfuerzo para fotografiar su belleza en invierno, por lo tanto, mi viaje de febrero. Que el Servicio de Parques pueda recibir algo de dinero por la emisión de permisos de estacionamiento no significa que obtendrán un beneficio. Las multitudes que observé requerirán mucho personal adicional del parque para gestionarlas. Eso cuesta dinero. El daño al paisaje que resultará también requerirá el trabajo de otros para repararlo. Eso cuesta dinero. Dudo seriamente que los honorarios recaudados cubrirán estos gastos. Tenemos un país hermoso, en parte, porque las personas con visión y el amor a la naturaleza han creado parques para preservarlo. El placer de unos pocos, que quieren ignorar las reglas, puede arruinarlo para el resto. Si aún no es miembro, le insto a unirse a Yosemite Conservancy. Es una forma sencilla de devolverle algo al parque y asegurar que sea un lugar que puedan disfrutar las futuras generaciones. Martin, Roger, and everyone else – for the record, the parking permits for Horsetail Fall are free. Thanks for the heads up, Michael. It’s been getting crazier every year. Last year, the conditions were optimal…I’ve never seen so much water coming down Horsetail before, but we could be in for some disappointment this year. (Where are all the storms? ) I guess they finally had to do something with the increasing traffic each year, but what a bummer to have to get a permit…especially on a weekday. I thought it only got crazy up there on the weekends. One of my main takeaways last year was that there are several new options to the main two viewing areas with the mass tree die-off. In fact, a large pine came crashing down just a couple hundred yards from where I was shooting and scared the **** out of me. It might be worth checking to see if you want to add a couple of alternative locations to your book, Michael. It might help to thin the herd a bit as just about everyone tries to squish into those two locations. A group of us were shooting East of Galen’s spot on the North side, but there were other spots further East on the other side of the road as well. If there is any up-side to the tragic loss of so many trees, it’s the fact that new views have now opened up on both sides of the river. I’m glad that tree didn’t fall on you! I still have your great image of the Firefall (and the valley with great clouds and sunset) from last year as my ‘screen’ background. Since your site was well to the east in the valley, any chance you can let us (your followers) where you were set up for that great image? I found the changes necessary to implement the permit program disappointing mostly for the adverse and dangerous changes to Southside drive. Two-way traffic on an icy and undivided road full of people who are unfamiliar with the area seems unwise. All of the fluorescent lane markers made it difficult to photograph over the road as well. Despite signs forbidding pedestrian traffic along Southside west of swinging bridge and the Four Mile Trail access, there were lots of people trampling the area. Next year, I hope the Park Service makes shuttle transit to the areas off of Northside drive compulsory. I think this would be an effective, earth-friendly, and less disruptive way of addressing the crowding issues while providing access to the largest number of photographers possible. While I’ve often been inspired by photographs of horsetail falls, I don’t understand the allure that makes standing elbow to elbow with others in disappointing conditions while there are plenty of great light and photographs to be made in the park at the exact same moment. Thanks for sharing your thoughts about this Doug. You bring up a good point about the safety of two-way traffic on Southside Drive, especially with people walking along the road. And I like the idea of shuttle busses, but I think they would need a lot of busses, and there would probably be some logistical hurdles involved in acquiring those busses for just a two-week period. I’ve heard many people express similar feelings about not understanding why so many people would want to photograph Horsetail Fall. Certainly it’s harder to understand when conditions are poor, as they were this year. This desire to photograph Horsetail used to puzzle me too (and still does to some extent). But I’ve come to realize that many people just want to have the experience of seeing and photographing it for themselves. And more and more, the people coming to view Horsetail Fall are not serious photographers. They’re not trying to capture some great photo of it – they just want to see it. And if you’ve ever seen Horsetail Fall with the right light and plenty of water, it’s truly spectacular. The photos actually don’t do it justice. I can easily understand why people would just want to see it for themselves. It is an amazing, natural phenomenon – which is what the park is supposed to be about.